Nineteenth century French critic Théophile Gautier described Paolo Veronese as the greatest colorist who was even greater than Rembrandt, Rubens or Titian. The artist was able to produce the perfect harmony of natural tones in creating light and dark contrasts without using the sharp light and shadow effects of chiaroscuro. French artist Delacroix said that they were taught that it was impossible to achieve, yet Veronese was able to retain the strength of the hues even in shadows. The artist Paolo Veronese, whose real name was Paolo Caliari was born in 1528. He was one of the greatest Italian Renaissance painters living in Venice. Veronese was known for his large-scale history paintings whose themes focused on mythology and religion such as ”The Feast in the House of Levi” and ”The Wedding at Cana.” Titian has a major influence in Veronese’s works, particularly in the development of his own naturalist style of painting. 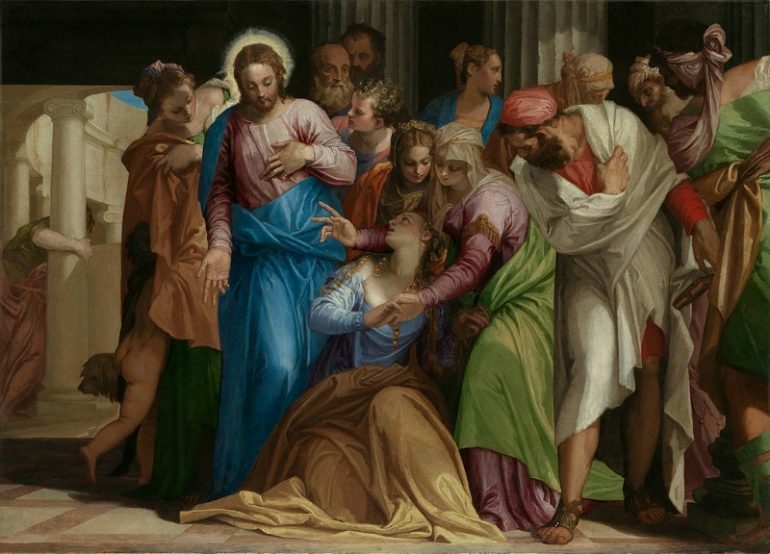 The works of Paolo Veronese were narratively elaborate, with plenty of drama and color. The backgrounds were majestic and pageant-like. Most of his ceiling paintings are still in situ in Venice, while the smaller paintings that are in museums do not represent the best of his body of work. Some of his admirers include Renoir, Delacroix, Tiepolo, Watteau and Rubens. Veronese was 13 years old when he became an apprentice of Antonio Badile. Three years later he was under Giovanni Francesco Caroto. Both these painters were prominent in Verona. One altarpiece of Badile’s that was done in 1543 already showed the workmanship of his young apprentice. With his talent, he surpassed what Badile’s studio could teach him, thus he sought another studio. He was trained in Mannerism that was the prevalent style in Parma but later developed his more brilliant palette. He was still in his teens when he started painting some of Verona’s important churches and received a commission in 1551, when he was 23 years old, to paint the altarpiece of the San Francesco della Vigna church that the Gustiniani family owned, which, at that time was getting rebuilt based on Jacopo Sansovino’s design. He also worked on the Villa Soranzo decoration with two other artists. A year after, he was commissioned by Cardinal Ercole Gonzaga to create an altarpiece for the cathedral of Mantua. He painted that in situ and even found the time to study the ceiling paintings of Guilio Romano. Later, Veronese made his mark as a ceiling fresco painters, and had decided to make Venice his permanent base. Veronese made Venice his permanent base in 1553 and that was after he received his first commission from the state – painting the ceilings of Sala dei Cosiglio dei Dieci and Sala dei Tre Capi del Consiglio. Later he decorated the ceiling of San Sebastiano church with “History of Esther.” This painting, together with the ceiling fresco at the Marciana Library firmly established his reputation as a master, and most of his paintings showed the heroism of the characters of Michelangelo and the fine foreshortening that exemplified the works of Correggio. It was while doing his many commissions that Veronese met architect Andrea Palladio, who had just finished the Villa Barbaro that Veronese was to decorate with ceiling frescos and wall paintings, including portraits of the Barbaro family. 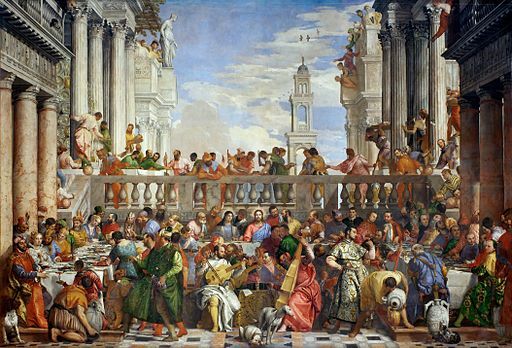 Palladio and Veronese again collaborated in the creation of ”The Wedding at Cana” for the San Giorgio Maggiore Monastery. It was commissioned by the Benedictine monks, who stipulated that the painting must cover 66 square meters; must use high quality pigments including lapis-lazuli for the blue colors and must have as many figures as possible. Veronese continued to improve his painting techniques through his many works. He was able to show the subtle interplay among the figures in the crowd; showed the incisive representation of various human emotions; provided focus on the consistency of the painting’s narrative and maintained his use of luminous and intense colors. Veronese’s skills were extraordinary and he was one of the first painters whose works were eagerly collected by patrons while he was still alive.